One afternoon in January, Sam came home from the store with a kid-sized shovel just for Luke. As soon as Luke saw it, he was in his snowsuit and out the door. Since then, every day that there's snow on the ground (so yeah, every day), he begs to go outside and "shobel" with daddy. 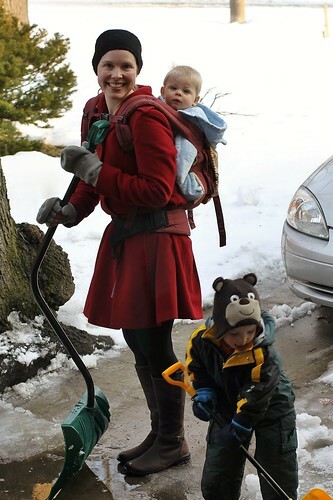 This afternoon I felt like getting outside and doing some work, so the boys and I headed outside to shovel. I made Sam take a picture just to get documentation that I do sometimes help with the muscle work, even if it means I have to take two little munchkins with me.